Compact, solid and reliable but in a world full of DAWs the DP-32 feels somewhat restrictive. Editing feels too clunky for master recordings. Monitoring features are quite basic. 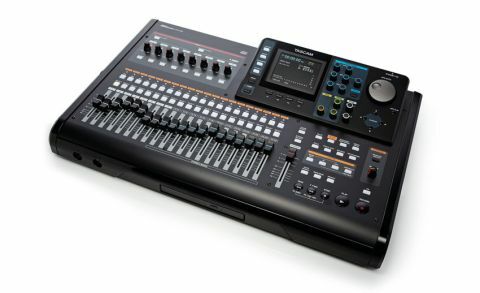 "While other manufacturers have come and gone, Tascam has stuck with the Portastudio concept, incorporating the latest technology to maximise performance, robustness and scale"
While other manufacturers have come and gone, Tascam has stuck with the Portastudio concept, incorporating the latest technology to maximise performance, robustness and scale. And they've turned out some units capable of very credible results. The DP-32 is the latest addition, following quickly in the footsteps of the slightly more compact DP-24, and it's now their flagship Portastudio device. It uses SD (512MB to 2GB) or SDHC (4GB to 32GB) memory cards for audio data storage, but also incorporates CD-R for mastering and USB for data transfer to and from computer. The default layout includes eight mono and 12 stereo tracks, although you can set the 12 stereo tracks to mono if you like, and recording is at 16 or 24-bit and 44.1kHz or 48kHz. Each track gets a dedicated fader plus Select and Record buttons. 'Select' ties in with the main display and control panel, which includes physical knobs (rotary encoders) for track EQ, panning and effects sends, as well as access to other functions. Meanwhile 'Rec' doubles as a solo or mute button when used in conjunction with the global mute and solo buttons above the transport. The DP-32 has eight inputs on XLR/jack combi connectors, and all are equipped with phantom power activated in two banks of four. Input 8 (H) can also handle high impedance guitar sources (there's a selector switch on the back panel). All inputs can be freely routed to any tracks or to the stereo output, giving the DP-32 a theoretical maximum of 40 channels at mixdown. Although to achieve this maximum, 12 of these would have to be stereo. In terms of outputs, there's a main monitor output on balanced jacks, main stereo output on unbalanced phonos, and one front-mounted headphone output. You also get physical outputs for sends 1 and 2. Rounding things off are a mini USB socket, MIDI in and out for MIDI sync, and a front-mounted mini jack for Tascam's RC-3F pedal remote. The DP-32 includes a small but hi-resolution colour LCD screen, which provides feedback and control of many of its functions. The main homescreen includes two pages - Time Line and Meters - offering good overall feedback of track usage, levels, routings and song position. The function buttons to the left - Assign, Mixer, Dynamic and Effect - access additional features, and combined with the four function keys, jogwheel, cursor buttons and dedicated rotary controls mentioned above, help you access all the relevant parameters. Further settings and features such as song management, SD formatting, preferences and the tuner are accessed via the Menu screen. The use of combi input connectors, an external PSU and SD cards for audio storage keep the DP-32 both compact and light, but the buttons, faders and controls still feel pretty solid. Even so, the lack of digital connectivity and one headphone output is slightly annoying. We also thought the included USB cable was absurdly short. The DP-32 uses a song-based filesystem and it's at this stage that you select sample rate and bit rate. With your song set up and selected you'll also get an idea of how much recording time you have available from the Remain indicator in the top right of the screen. This hours and minutes counter indicates overall track time, so if you select multiple tracks to record it will update accordingly based on your current song length. Routing signals is pretty straightforward and with the Assign page active, you can either use the Source and Select buttons, or cursor around the screen manually. It's worth noting that you can route one source to more than one destination track. The DP-32's one headphone output receives the same monitor signal as the main monitors, which is somewhat restrictive. However, if you really need a separate feed you could use send 2 and hook up an external headphone amp. Next up, the included effects routing allows you to apply the Dynamics block, EQ and the Guitar Effects block prior to recording, which is a nice touch. "AudioDepot allows you to import and export WAV files via a shared folder on the SD. You can then load it all into a DAW - all your track files are rendered from zero so it all lines up"
With signals routed and monitoring sorted, the nitty gritty of recording with the DP-32 is amazingly simple, and with Rehearse, Auto Punch (and footpedal control if you buy their proprietary one), there are various ways you can fine-tune your ways of working. As far as multiple takes are concerned, you can actually create up to eight virtual tracks for each track, allowing easy stacking of multiple takes. However, while this is a positive experience, DP-32's editing capabilities are less well implemented. Editing functions (cut, copy, paste, silence, track clone and so on) all rely on setting in and out edit points using the transport locators, and although you can zoom in and use the scrub wheel to view waveforms of each track, it feels too clunky for careful editing of your master recordings. However, the DP-32 has one rather useful trick up its sleeve in the form of AudioDepot. This allows you to import and export WAV files via a shared folder on the SD. Once you transfer this to your computer (either on the SD or via USB) you can then load it all into a DAW. All your track files are rendered from zero so it all lines up, and you're ready to edit, mix or both. The DP-32 delivers an interesting combination of features, and in typical Portastudio style, attempts to give you everything in one box. Winning features are its compact size and simple design, and for us its strengths clearly lie in tracking, which is why the basic monitoring features are a bit disappointing. The included EQ, Dynamics and Send Effects are simple but sound great, allowing you to quickly tailor your signals at source. If you can get your head around the DSP sharing limitations, the Guitar Effects are also a nice touch, perfectly useable and, again, can be recorded if you wish. Although it has the facility to master your mix and burn it to CD-R, the option to transfer the track audio to your computer and edit or finish the process in a DAW is what really matters here, and for us that's what makes the DP-32 still relevant in this DAW-dominated world.